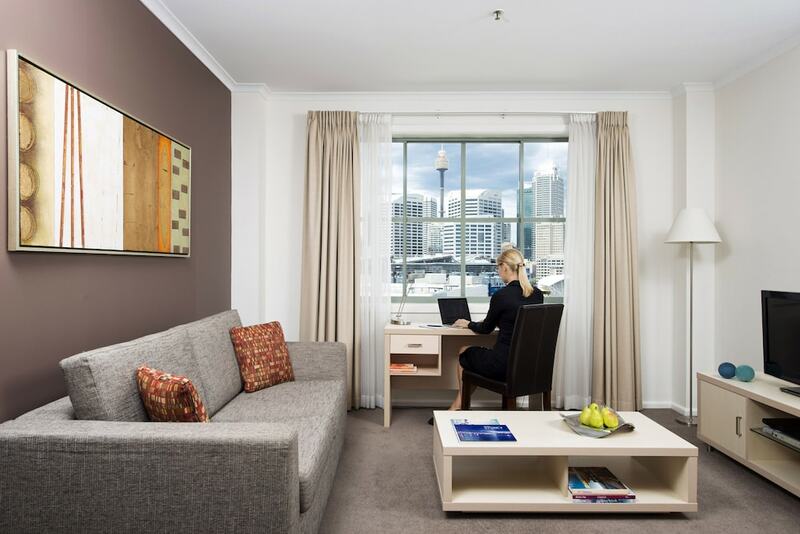 With a stay at Oaks Goldsbrough Apartments Darling Harbour , you'll be centrally located in Pyrmont, a 8-minute walk from Australian National Maritime Museum and 11 minutes by foot from Harbourside. This 4-star apartment is 0.5 mi (0.9 km) from Chinese Garden of Friendship and 1 mi (1.6 km) from Paddy's Market. Make yourself at home in one of the 322 air-conditioned rooms featuring kitchenettes with refrigerators and stovetops. Cable programming and DVD players are provided for your entertainment, while complimentary wireless Internet access keeps you connected. Conveniences include microwaves and washers/dryers. Be sure to enjoy recreational amenities, including an indoor pool, a spa tub, and a sauna. Additional amenities at this apartment include complimentary wireless Internet access and shopping on site. Featured amenities include dry cleaning/laundry services, a 24-hour front desk, and luggage storage. Planning an event in Pyrmont? This apartment features 100 square feet (9 square meters) of event facilities. Self parking (subject to charges) is available onsite.